Skye Anderton was born in Brisbane in 1979 and grew up the eldest of three children. From a young age, she was always creating things and looking to discover more about the world. While studying an Arts/Business degree at QUT, Skye started tinkering with beaded jewellery and hand painted bags, selling her home-made products at local markets and to small boutiques. Despite her skills, Skye was told her passion for accessories was a hobby, which would never make her any real money! To get some 'real' experience, Skye left Australia for London, accepting a position as an accessories buyer and product developer for a large high street retailer. As part of this role, she took responsibility for many millions of pounds worth of product. After returning home in 2010, Skye relaunched her business, naming it Ruby Olive Jewellery and quickly grew to stock over 150 stores in the first two years. The business gained a reputation for creating purposeful products with stories and soul. In 2014, Skye won the Telstra Young Business Person of the Year award for QLD. She was named one of QLD's Best and Brightest, gave a TEDx talk on purposeful profit and raised $15,000 in 30 days for The Hunger Project, a charity very close to her heart. Since then she is a sought-after speaker, giving presentations which focus on women in business and global women's empowerment. Today, Skye lives in Brisbane with her husband and two young boys. She is a huge advocate for living positively, passionately, and living purposefully. The core mission for Ruby Olive is to support the community, put smiles on faces and to inspire people to live the boldest life they can. Skye is featured in Dale Beaumont's new book, 'Secrets of Successful Entrepreneurs Exposed'. For more information visit www.dalebeaumont.com. 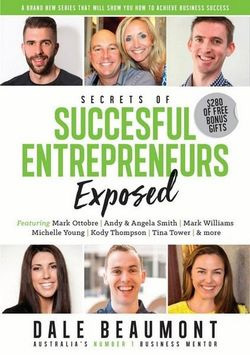 The Secrets of Successful Entrepreneurs Exposed brings readers up close and personal with highly successful entrepreneurs in a range of industries. The book features a Q&A with 14 entrepreneurs and delves into the secrets behind their business mindset and entrepreneurial success. Question: What inspired your passion for making jewellery? Skye Anderton: Ever since I was at school, I've loved making things with my hands. I loved painting and putting things together. When I was 15 someone asked me 'what do you want to do when you grow up' and I remember replying, 'I'm going to have a handbag business'. People would often say things like, 'that's nice and all, but what profession will you go into?'. That response always baffled me, as I never really wanted a 'profession' and I think those sort of replies made me even more determined to do something differently. 'I'll show them'...I quietly thought. When I was at uni I started making hand painted bags and sold them at the markets and began playing with beaded jewellery to complement my offering. Over time my basic 'self-taught' jewellery skills evolved and I started selling to local fashion retailers. My elaborate pieces were selected to feature in music videos and I was invited to showcase my pieces at Australian Fashion Week. This was my big turning point. And I said no. Instead, I packed my bags and moved to London to try and get some experience in the world of fashion. I knew absolutely nothing about how to scale my business and felt I had so much more to learn. I knew that if I was to grow my little business I needed to dive in deep and immerse myself into something I knew nothing about. That was one of my best business decisions, I came back 8 years later a very different person with an incredible skill set and network. Question: Where do you find inspiration for Ruby Olive ranges? Skye Anderton: The inspiration for all of our Ruby Olive collections come from the world around us, from memories, travels and everything I see outside my window. When we stop and look around, there really is inspiration everywhere. The texture on a tree, the colours of a streetscape, the childhood memories of eating rainbow ice-cream at a funfair. My mind is always working overtime. Question: Can you share your advice for living positively, passionately, and purposefully? Skye Anderton: Hmmm, interesting question. I guess it's not really a conscious thing anymore…I just do it. I honestly believe though, the more work I do on my own personal mindset, the more positively, passionately and purposefully I live. I've always been a glass half full kinda gal and like to see the positives in situations but about 4 or 5 years ago I really started to dig deep on how our inner beliefs and attitudes which are so deeply ingrained within us can impact our lives both positively and negatively. I also think my time living abroad and travelling to third world countries has changed my perspective on so many things. Question: How does Ruby Olive support the community? Skye Anderton: One of our key business pillars is 'supporting our community' and we're passionate about it on many levels. By community we're referring to the people and organisations, both locally and internationally, that share the same philosophies, in particular the empowerment of women and girls. We want lift up other women that are doing amazing things through sharing their stories and lending a hand where we can. One of our key hashtags is #celebratingamazingwomen, and we believe every woman is amazing, in their own unique way. We support a variety of charities financially through product sales and product donations. We also facilitate an amazing online community of customers who inspire and uplift each other every day. This community of approximately 800+ women not only post their daily outfit choices featuring Ruby Olive, which are always meet with such lovely comments, but they also share life's challenges and ask for advice. This group really is the epitome of a supportive community. 1. Get inspired " When I was at university and before I knew anyone that had their own business, I constantly ripped articles out of magazines and newspapers about women who had started businesses that were now successful. I had a scrapbook they all went into and that started my dreaming. That book was a constant source of inspiration. At the time, I didn't know what I wanted to do, but I knew I wanted to create an impact like these women. 2. Start something " Even if you have no clue, the pure act of starting something, no matter how large or small, gets the ball rolling. It can only grow and you can only learn from there. If I had never started making hand painted handbags at 16 years old to give to my family, I may have never decided to make the very scary leap at 18 to have my first market stall. Had I never gone to that market, I never would have met that local stockist who gave me that first break. Had I not had that first retailer, I would not have learned how to deal with stockists. Although my current business is so far from those days and a lot has happened in between, it really just began with starting something small and improving on it everyday. 3. Get experience and listen to mentors " Never underestimate the value of good mentors and good work experience. Learning from those who have been there before can save you a great deal of time and pain. I left my little business in Australia in my early 20's to travel to London where I got a job in Buying and Product Development. I can honestly say that without having that experience and being able to learn from my amazing boss (who was my absolute mentor), my business would most certainly not be what it is today. Skye Anderton: Being brave and taking the jump before you think you're ready is one part, but the second part is ensuring you have the tools and support network to help guide you in the right direction. Having a clear vision of where you want to go and a strategy of how you're going to get there is so incredibly important (even if that strategy changes 100 times) and running them past people you trust to get additional ideas and feedback is essential. Skye Anderton: I certainly won't pretend I never procrastinate and that I'm a productivity guru, in fact that's far from the truth. However, breaking down tasks and writing down everything in a program like Trello helps me A LOT. I try to create a checklist for key processes (like a new collection launch, or a photoshoot) that we can just follow the same steps each time and repeat certainly helps with productivity and thinking time. I also like to write down three key things at the beginning of the day/week/month (day = more specific tasks > month = more general goals) that I want to achieve and I prioritise these three things - I find it makes the day/week/month less overwhelming. Skye Anderton: I'd love to say my morning routine involves yoga and other mindful activities, followed by a quiet coffee, a coconut yogurt chia fruit bowl and a blissful long hot shower. Sadly though, I can't say that…I have two young very active boys…and a dog. In reality my mornings involve wrestling clothing and shoes on the boys, which often come off before we've even left the house. Getting them to eat their breakfast, which often takes 30+mins, making sure their lunch boxes and school bags are ready to go and then once my husband takes them and the dog to the dog park I finally get to have my long blissful hot shower. Question: What's next for Ruby Olive? Skye Anderton: So many exciting things on the horizon for us at Ruby Olive. We're growing quite rapidly into the US market (both direct-to-consumer and wholesale) and our products are sold in art gallery gift stores such as the San Francisco MoMa, so we'll be continuing to grow in these new markets. We're also working on some exciting new product lines, some will launch in time for Christmas, some next year.